question asked: Jun 01 '13, 8:41 a.m.
last updated: Jun 02 '13, 2:06 p.m.
CC RTC Synchronization fails: case sensitive username? Simon Eickel (1.1k●6●51●56) | asked Jun 01 '13, 8:41 a.m.
edited Jun 01 '13, 9:00 a.m.
it's me again with a little question. As I'm using the synchronizer more and more I have some more questions related to it. Is it possible to sync sub-sub folder from RTC to CC without getting the mid folders syncronized, too? 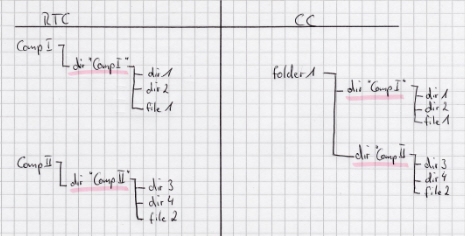 Is it possible to just synchronize the dirs "dir1" and "dir2" from the RTC side to the CC side without getting the dir "CompI" created? What I need is that I mark a folder as subVOB component with the CC attribute. Lets say the folder is called "BasisDiverse". In CC this folder contains a folder called "ClearQuest". When I now mark the ClearQuest folder within the RTC component (picture above) he creates in CC a folder called "Access_Room_Overview" and within this folder he creates the folder ClearQuest. But what I need is that he directly synchronizes the "ClearQuest" folder inside the subVOB component "BasisDiverse". I'm not sure if the explanation is understandable, but I hope so. Geoffrey Clemm (29.0k●2●30●35) | answered Jun 01 '13, 1:08 p.m.
One reason is what is the synchronizer supposed to do if CompI and CompII both contain a folder named "dir5"? It could throw a "conflict", but then the likelihood of the user getting confused (and/or annoyed) is high. So we try to minimize the possiblity of conflicts. Simon Eickel commented Jun 02 '13, 12:07 p.m.
Any idea how to get a good workaround, except Symlinks, for this? Simon Eickel commented Jun 02 '13, 12:10 p.m.
Is it possible to explain the synchronizer to use "load rules"? In this way I could give him a load rule which he should synchronize ;) Would be a nice scenario, too. Geoffrey Clemm commented Jun 02 '13, 2:06 p.m.
A "load rule" approach is certainly a possible enhancement. I've created the work item Allow specifying the component-root-relative pathname of a synchronization root (267544) so we can discuss the details of what this would look like (and prioritize when/whether it would be implemented).